I was recently at the Canadian National Exihibition. This is a trade show that happens every year in Toronto, with carnival rides, venders selling various items, and live shows. I saw Rick Springfield, yes, he’s still handsome and no, he didn’t sing Jesey’s Girl. While I was there I was drawn to the Ruby Cosmetics booth because they claimed to have a revolutionary brow powder and were offering a great deal to get it! I received the Picture Perfect Brow, the Ruby Brush, an Eyeshadow Kit and Lip Gloss – All for $40, a huge discount compared to their online price of $130. I had never heard of this brand before and I thought that for the price it was worth giving it a go. Why is this so special? Well, the product claims to be water and sweat proof, the girl behind the counter even said I could go swimming with this and it wouldn’t faulter. It has built in wax to hold the hairs in place and each brow container gives about 700 applications making it long lasting. Check out their UK Site for more info, I thought it was better compared to the Canadian one. I purchased the dark brown brow powder. I also choose the Brown Eyeshadow Kit and the Red Hollywood Shimmer Lip Gloss. Unlike most powders this comes on pretty creamy. This is a large container and a little goes a long way with this product. It doesn’t sit on top of my eyebrows either and really coats the hairs. 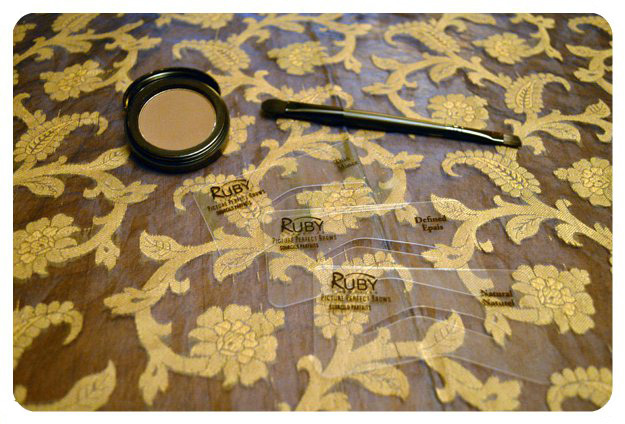 The kit came with three stencils to use as guides for application. I used the “thin” size for my brows. The double ended brush is made with synthetic bristles but feels pretty high quality. There is a round end for all-over coverage when first applying the product with the stencil, and the angled side allows you to further define the brows. The inside of the eyeshadow kit has a guide to help assist in applying the colours, I thought that was really useful. I tried to follow it in the finished eye look below. 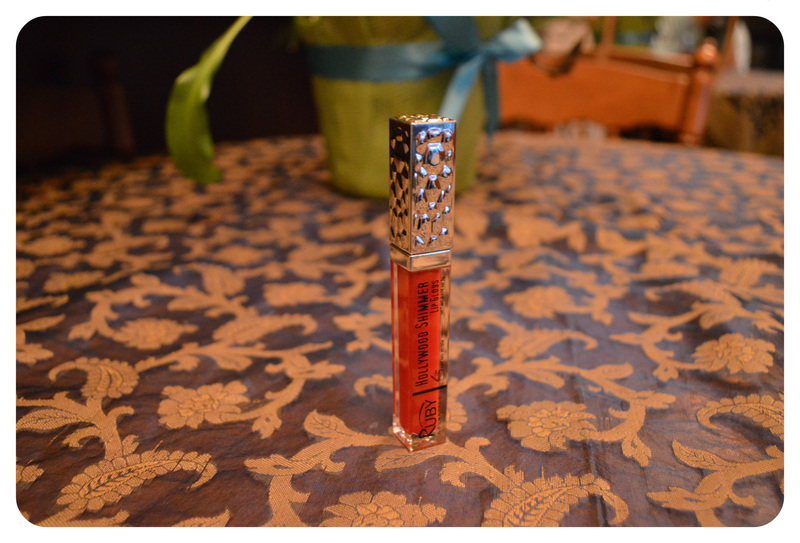 The gloss is an orangey-red tint and is applied via a sloped applicator wand. 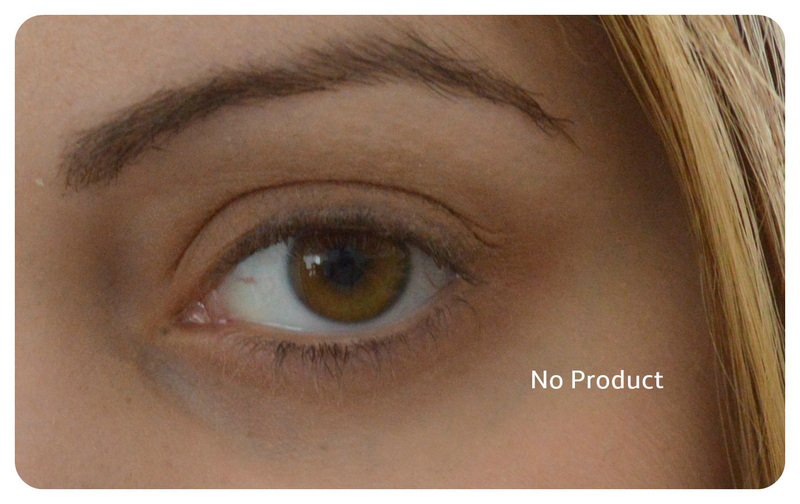 I really liked the nice natural look of my brows using this product. It lasted all day, even with heat and a little sweat the colour stayed solid. My eyebrows also stayed in place and I didn’t need to add any extra brow wax like I would with other brow powders. The eyeshadow quad looked nice for the day, but the pigmentation was a bit light and I felt it wore off a bit. Although I did like the colour of the lip gloss, it’s not long lasting. I felt that I had to re-apply way too often during the day. Although I really like the brow powder I don’t know if I’ll re-purchase this. It’s only sold online, or in trade shows, and I’m not sure I’d get the same amazing deal. Luckily this is designed to be long lasting so it may be a while before I need to get a new one. With so many eyebrow powders in the market I’m likely to just move on to something new. The eyeshadow quad is ok, I think you’re better off spending your money on other palettes. I definitely was not impressed with the lip gloss. 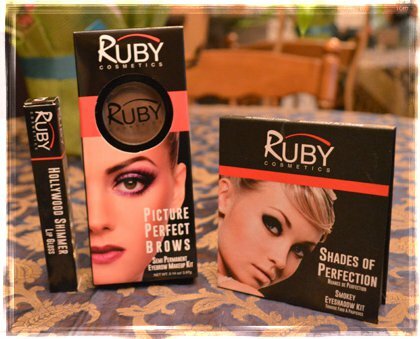 Have you tried Ruby Cosmetics? What new Eyebrow product have you tried lately? Aww! thanks love! did you have time to see the CNE this year? I leave Friday!!!! I’m so excited! Never been to the places I’m going to so I can’t wait for the adventure! I’ll be sure to put up some travel posts 🙂 how’s the west so far? 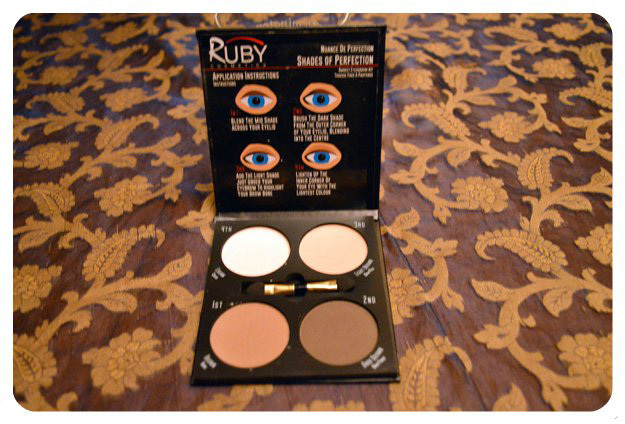 Just read your review about Ruby cosmetics..it says the brow powder last 2-3 years. How long did it last for you .. I think I ended up tossing it out after 1 year, it was still in good shape I just stopped using it! How frustrating! I didn’t have that issue but it was such a meh product for me that I didn’t keep it. Hopefully you can get it to open! I got my kit in Calgary at least 3 years ago…LOVE LOVE the brow powder and I am just now needing to order a refill. It’s the best brow powder I have used! !